September has gone, and FOODCOIN Team has something to tell the community about. 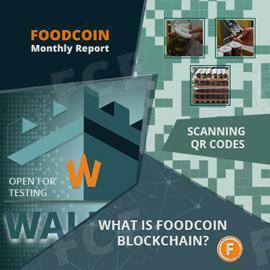 FOODCOIN Team is going to present a review about events which was carried out over the last month. -	FOODCOIN Team started publishing presentations about FOODCOIN ECOSYSTEM and tools it consists of in order to give an understanding the structure of the system. The first presentation outlines the concept of FOODCOIN ECOSYSTEM, how double protections for transactions works, the systems of Verificators and Guarantors, and who can become both of them. -	One of the main components of FOODCOIN ECOSYSTEM, WALLOK is open for public testing. It has already several features, such as adding metadata to the blockchain and creating PRORIDs - recordings about products, their connections and shipping. The development is done, and to make WALLOK fully functional, it must be tested. To learn about how it works, you can refer to the following post. -	Singapore Airlines started playing FOODCOIN ad on the in-flight entertainment systems. FOODCOIN Ecosystem will be advertised during flights from and to Singapore, and it’s expected to raise the visibility of FOODCOIN. -	New food producers are starting to implement FOODCOIN Ecosystem blockchain to improve the traceability and visibility of their supply chain. The first one is FOODCOIN’s partner, ALDIM GmbH. The products, pickled cucumbers and sauerkraut can be found and tracked in FOODCOIN blockchain by scanning QR codes on the jars and caps. Here are some technical milestones which have been accomplished so far. •	Development of the Wallet for FOODCOIN blockchain network. -	Fine-adjusted the working mechanism for personal data. -	PRORID system improved: contract types reworked, data verifier mechanism added. -	Instant transactions system and licensed mining are being worked and improved. •	Beta testing of FoodScan and WALLOK private network. -	Testing and improvement of the existing functionality. •	Now you can evaluate the quality of products and request a discount from Sennereigenossenschaft Obergesteln! -	Implementation of the updated prototype. -	Implementation and testing of BTC and FOOD support. •	UI/UX elaboration for new FoodScan prototype and its implementation.